"That's right. We don't submit to terror. We make the terror." -- President Frank Underwood from "House of Cards"
As we've seen in previous examples, the astrological charts of successful actors tends to reflect the traits of characters they are repeatedly called to play. Veteran actor Kevin Spacey often plays the villain to spectacular effect. In the past, he's been a hit as a ruthless gangster and a shockingly creative serial killer. Now in Netflix's Americanized remake of "House of Cards" he takes a riveting turn as a clever and unscrupulous politician. Dionysian: Pallas semisquare Pluto and contraparallel Jupiter. This puts Spacey between the "Criminal" and "Statist" quadrants of "the Axis of Good and Evil". Collectivist: Sun ruling Second House is trine South Node and square Neptune. Liberal: Moon ruler Mars sextile and contraparallel Neptune. Moon quindecile Neptune, which is in the Fourth House. 1. Pallas semisquare Pluto and contraparallel Jupiter. 2. Sun ruling Second House is trine South Node and square Neptune. 3. Venus widely conjunct Second House Pluto. 5. Pluto tightly semissextile Sun. Surprise, surprise. An actor who plays murderous Left-wing politician has a chart resembling that of a murderous Left-wing politician. Spacey himself has publicly supported Democratic murder-maven Hillary Clinton. In this way, the "evil" in the chart actually spills over into real life. Sun square Neptune: nebulous or fluid self-expression. Great for actors and politicians. Moon at MC: note the round face and the protectively bulky physique, both associated with the Moon and/or Cancer (the latter mostly in men). Pallas at IC opposite Moon: very much the fighter. Moon at MC contraparallel Chiron: Spacey's characters are often visibly wounded (limping, disfigured hands, shot in public). Mercury conjunct Uranus, square Jupiter in Scorpio: disruption through language for the purpose of expanding power. Mars sextile and contraparallel Neptune and conjunct Pluto in Virgo: hidden acts of evil, meticulously executed. 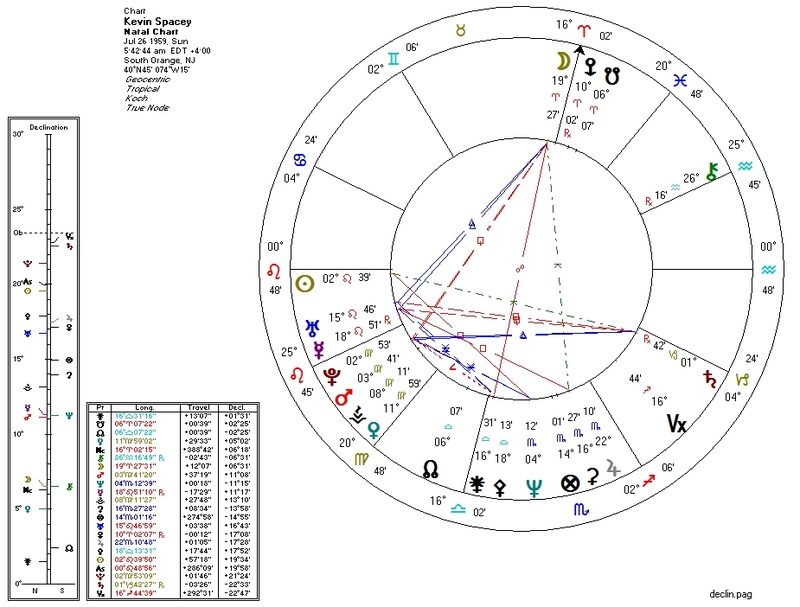 Saturn trine Mars/Venus conjunction: these three planets together plus Neptune involvement with Venus and the Moon tend to indicate potential musical ability. Spacey is a decent singer. Pallas parallel Uranus: Spacey's portrayals tend to be stunningly original and his characters tend to create their own universes. Much of the entertainment value "House of Cards" comes from watching Spacey's character do horrifically evil things in order to gain and maintain power. It is in large part the horror of these acts that makes the show as fascinating as it is. The true horror, however, is that real-life politics are even more horrifying than fiction. There is ample evidence that every US president elected in the past three decades has committed far more heinous crimes than Frank Underwood could ever dream of. Real life makes "House of Cards" look like "The West Wing".